MBA admission process in top MBA colleges opens every year in the month of July/August and closes after 2-3 months from the opening date. While IIFT, IIMs, XLRI, NMIMS, SIBM among others open their admission process in July-August, other top MBA colleges like FMS, MDI, SPJIMR, IMI, IMT begin their admission process in September-October and close it in December. If you are planning to do MBA from one of the top MBA colleges in India, you must be aware how to take admission in MBA college and understand very well the MBA admission process of the MBA college where you want to apply. All the top MBA colleges have one or other different component that determines the eligibility for MBA admission and a different MBA admission procedure. To know the MBA Admission process 2019 you should also be aware about the procedure for MBA Entrance Exams. You need to appear in one of these MBA entrance exams to get through the MBA admission process of the B-school. Although MBA admission process in India for all the top MBA colleges is almost similar, the difference is their acceptability of MBA entrance exam score. For example, IIMs accept CAT exam score, XLRI accepts XAT exam score, NMIMS accepts NMAT exam score, Symbiosis accepts SNAP exam score, IIFT accepts its own IIFT entrance exam score and so on so forth. MBA colleges like FMS Delhi, IIFT Delhi, XLRI Jamshedpur, MDI Gurgaon, SPJIMR Mumbai, NMIMS Mumbai, IMI New Delhi, IMT Ghaziabad, IITs follow the 4 steps Admission process to their flagship MBA/PGDM programmes. MBA Admission process in India in all the top MBA colleges is a four step process. 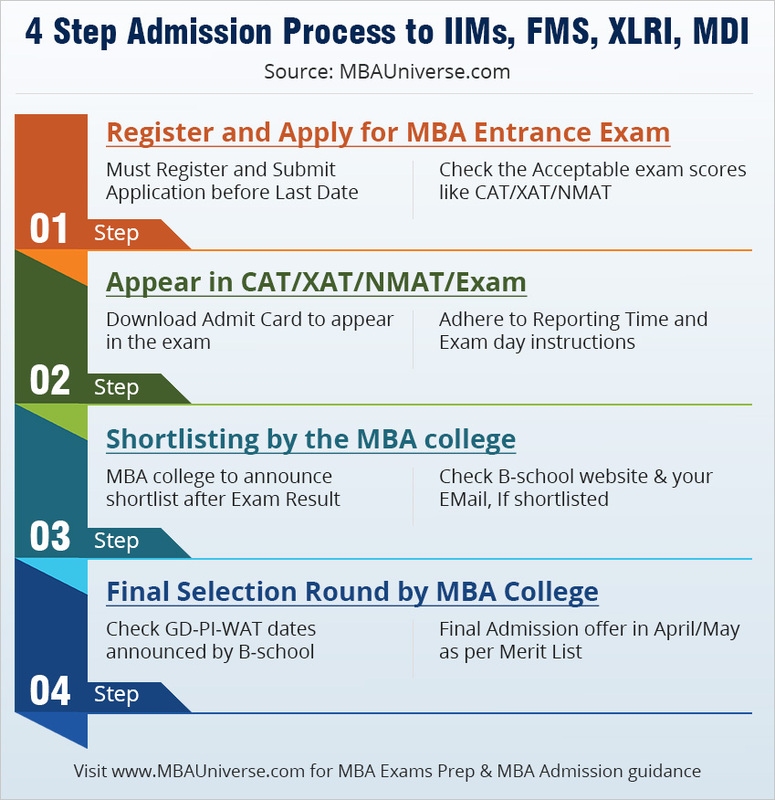 These 4 steps of MBA admission process are applicable to all the MBA colleges including IIMs who offer admission after a rigorous selection process to select the most suitable candidate. The admission process in top MBA colleges open in August/September first week and closes in November last week. Candidates desirous of seeking admission in top MBA colleges should register and apply for the relevant MBA entrance exam like CAT/XAT/IIFT/NMAT/SNAP within the specified registration window. Most National level MBA entrance exams like CAT, XAT close the registration process in September and November respectively. Usually the CAT registration process remains open for 45 to 50 days. Those who want to pursue management course PGDM/MBA programme from top MBA colleges must appear in CAT, XAT, NMAT or other relevant entrance exam. After declaration of MBA exam result in January, most of the top B-schools will shortlist the suitable candidates for final admission round on the basis of exam scores, academics, diversity, work experience among other parameters as per the respective B-school admission policy and weightages. The process is completed by each institute individually. All the shortlisted candidates shall have to appear in the Group Discussion (GD), Written Ability Test (WAT) followed by Personal Interview (PI). Some of the B-schools like FMS will conduct GD & Extempore before PI round while few other like MDI will conduct GD-PI and a few like IMI will conduct Psychometric test also. Some of the IIMs like IIM Shillong, IIM Kozhikode also conduct GD round based on the WAT. On the basis of their performance in final selection round, weightage awarded to entrance scores, academic profile & diversity, work experience and gender diversity, final merit list will be generated and admission offers will be made by the respective B-school.